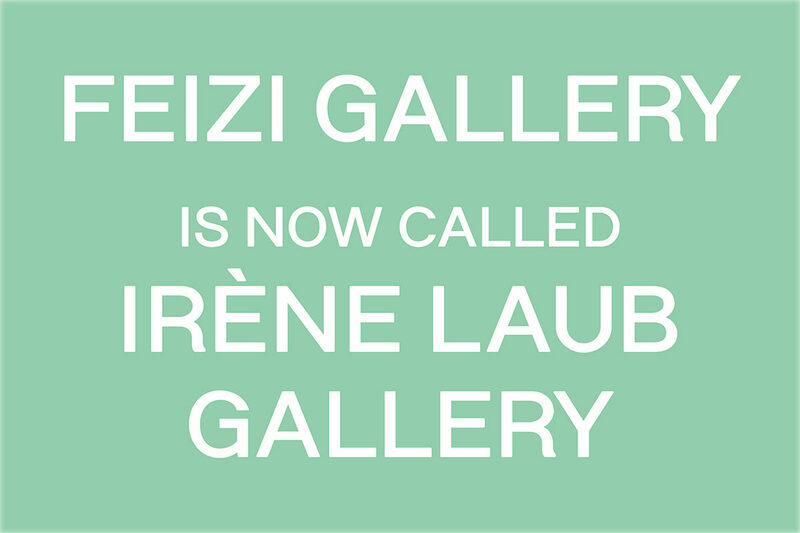 Coming September 8th, Feizi Gallery will be renamed Irène Laub Gallery. The change of identity reflects the Gallery’s reorientation decided by its initiator Irène Laub. Dropping its specific Chinese contemporary art profile, it seeks artists with strong messages the world over and with a propensity for cross fertilization. Travelling, opening up to others, discovering different cultures, very quickly becomes Irène Laub’s chosen way of life, herself a French national from multiple origins. To comfort this urge, she first engages in an international career. Simultaneously, she satisfies her thirst for discovery by launching herself in art collections encountered in her travels. On a trip to China, she discovers a contemporary art scene in full mutation, both buoyant and dissenting. Her interest heightened, she is carried by the movement’s flow and in 2008 opens a gallery – FEIZI – in Shanghai. Determined to share committed Chinese artists’ messages and conceptual strength, Irène Laub takes advantage of her European trips to launch exhibitions promoting Chinese contemporary art. She opens her art space in Brussels in 2012 where she displays politicized Chinese contemporary scenes, scenes which are frequently forbidden by the Chinese authority, hence providing a free platform for expression to curators and artists engaged in controversial art, joining the same fight as Ai Wei Wei; such as He Yunchang, Xiao Yu or Qin Ga. The boldness of her artistic choices are very quickly noticed; once installed in Brussels, she participates in prestigious fairs such as Art Brussels, and directs a performance by He Yunchang, in collaboration with the BOZAR museum. To broaden her scope, Irène Laub gradually brings together Chinese and Western artists’ comparative views. This new approach is a learning curve for her. It enables her to appreciate with a keen eye the wealth and diversity of contemporary artistic productions and the commitment of young budding artists from different worlds and culture. At present, she supports artists anchored in contemporary art who display important society issues ranging from the human condition to the treatment of women, migratory movements, ecology; her eclectic art direction no longer displays territorial concerns but is more a reflection of the times. On September 8, the launch of her new gallery will coincide with the opening of her first heart-stopper exhibition: Nowhere Beyond. This is the second solo exhibition in two years dedicated to Tatiana Wolska whose sculptures and drawings bring new life, of a strange and poetic nature, to salvaged objects. Tatiana Wolska is a Polish artist who, after a brief spell in Nice, will be living and working in Brussels. A former pupil of Villa d’Arson, she has exhibited in the Palais de Tokyo in Paris. French painter Jérôme Robbe will present his series L’air de rien, which approaches painting as a series of attempts puts the spectator’s perception to task.